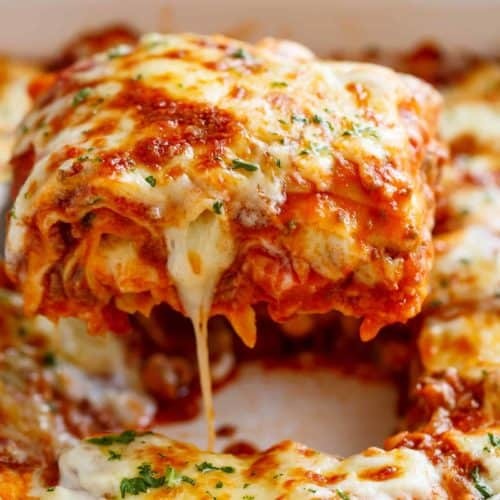 The Best Lasagna is here! Layered with a rich meat sauce and a creamy parmesan white sauce, plus the perfect amount of mozzarella cheese! NO ricotta cheese needed! My mama’s famous lasagna recipe is hands down the best lasagna I have ever had in my life. She learnt her ways from her Italian friends when she lived in New York City, adjusting the recipe through the years to perfect it…and every single person that tries her recipe comes back for seconds, thirds and leftovers for the next day! Just LOOK at that CHEESE! I blame this post all on her. This recipe is not exactly ideal to look at and salivate over in a month that we are all on our low carb, Keto, paleo, weight watchers, cabbage soup, low fat, low carb, rabbit food diets. But…It’s Lasagna. And I DO know that many of us still have to cook ‘normal’ foods for our families. “Ugh. OKAYYYY FIIIINE. You cook, I’ll shoo…” banging and clanging going down in my kitchen, wooden spoons flying around everywhere, fridge door screaming to be closed before I could finish my sentence. Ah…the chaos. The most important part of this whole things is her sauce. It’s rich with flavour and texture. Our sauce is made with a mix of ground beef and pork. This is OPTIONAL. If you don’t like pork you can definitely use beef to replace it, but the pork does add a traditional lasagna flavour to the sauce. Most sauces use crushed tomatoes as a base, however we love mixing in a bottle of Passata (or American tomato sauce) to add richness. Using tomato paste results in a thick and rich sauce. Don’t skip this ingredient! We love using one with garlic and herbs, but plain is also fine. This is where things go from yeah, it’s okay TO oh-my-god-this-is-so-good! We don’t use any ricotta cheese in our lasagna. Not because we don’t like ricotta (mmm….could go a Spinach and Ricotta Grilled Cheese right about now), but because white sauce makes it so much more flavourful. Especially her parmesan white sauce. 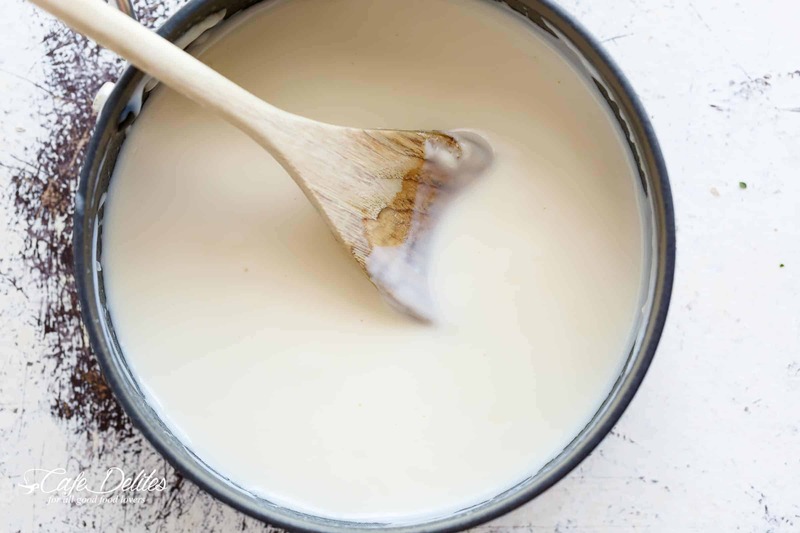 It’s SO GOOD you’ll want to put this Béchamel on EVERYTHING! Parmesan cheese. If you don’t like parmesan, replace it with Gruyere, Romano, Asiago, Manchego, or more Mozzarella. We prefer fresh lasagna pasta sheets which are found in the refrigerator section of most grocery stores. If you can’t find or don’t have access to fresh, you can use dried. No Cook or Instant Noodles can be used without pre-boiling (check the packet instructions first). You can assemble as normal. To ensure the pasta has enough liquid to cook through while the lasagna is baking, we normally add about 1/2 cup of water to our sauce when using INSTANT. Pre Boil Or Pre Cook Pasta Sheets need to be boiled first before assembly. Follow the instructions on the packet. Add a couple of tablespoons of olive oil into the water to prevent the sheets from sticking together and stir them occasionally with a wooden spoon. Transfer each cooked lasagna sheet carefully into a large bowl or pot filled with cool water to help stop the cooking process. Leave them in there until ready to use. This helps prevent them from sticking together or drying out. You can do this while the meat sauce is gently simmering away so all elements are ready at the same time. 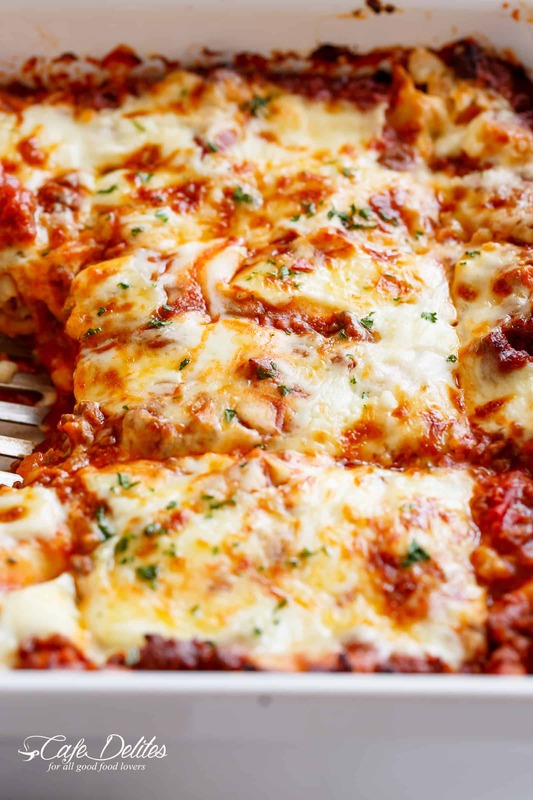 Once you’ve layered your lasagna, you need to make sure you last layers (or top layers) finish with pasta > meat sauce > white sauce > mozzarella cheese. Yeah, that order results in a golden, crunchy and cheesy top with a layer of juicy meat sauce underneath. 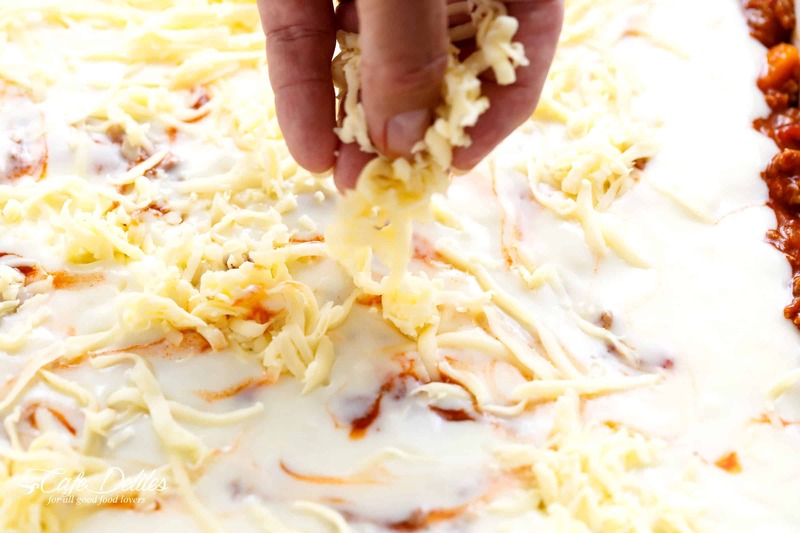 Crispy edges, a gooey, cheesy centre, perfectly cooked fresh lasagna pasta sheets in between a creamy parmesan white sauce and an abundance of cheese. For more lasagna variations, you might like these: Easy Slow Cooker Lasagna Soup | Spaghetti Squash Lasagna Boats | Easy Lasagna Stuffed Burritos | Beef And Pumpkin Lasagna | Chicken Pumpkin and Ricotta Lasagna! Heat oil in a large pot over medium heat, then add in the onion and carrots and cook for 8-10 minutes, or until softened. Add in the garlic and sauté for about 1 minute, until fragrant. Add beef and pork (if using) and cook while breaking it up with the end of your spoon, until browned. Pour in the Passata, crushed tomatoes, tomato paste, crushed bouillon and dried herbs. Mix well to combine and bring to a gentle simmer. Season with desired amount of salt and pepper (I use about 3/4 teaspoon each) and sugar if needed. Cover and cook for about 20-30 minutes, occasionally mixing, until the sauce has thickened slightly and meat is tender. Adjust salt, pepper and dried herbs to your taste. In a large pot, melt butter over medium heat. Remove from hot plate; add the flour and whisk for about 30 seconds, or until well blended. Place pot back onto stove, reduce heat down to low and slowly whisk in 1 cup of the milk until well combined. Once well blended, add the remaining milk in 1 cup increments, mixing well after each addition, until all the milk is used and sauce is free from lumps. 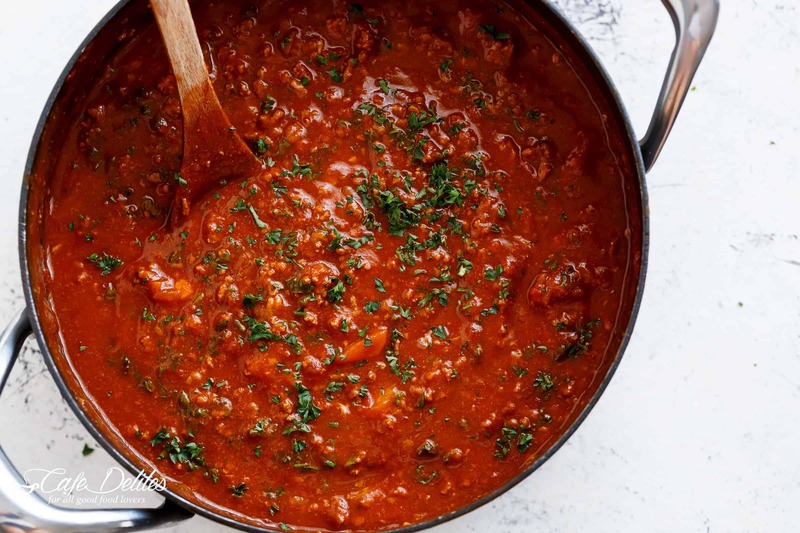 Increase heat to medium and continue cooking sauce while stirring occasionally until it thickens (about 6-7 minutes) and coats the back of your wooden spoon. Add in the parmesan cheese and remove from heat. Season with salt and pepper and mix until the cheese is melted through. Preheat oven to 350°F | 180°F. Spoon about 1 cup of meat sauce on the base of a 9x13-inch baking dish, then cover with lasagna sheets. (Trim sheets to fit over the meat if needed.) Layer with 2 cups of meat sauce (or enough to cover pasta), 1 cup of white sauce and half of the mozzarella cheese. Repeat layers (leaving the remaining cheese for the top). Pour the remaining meat sauce and white sauce over the last layer of lasagna sheets and top with the remaining mozzarella cheese. Bake for 25 minutes or until golden and bubbling. Garnish with parsley and let stand for about 10 minutes before slicing and serving. *Fresh lasagna pasta sheets are found in the refrigerator section of most grocery stores. We prefer fresh pasta in our lasagna, but if you can't find or don't have access to fresh, you can use dried. Pre Boil Or Pre Cook Pasta Sheets need to be boiled first before assembly. Follow the instructions on the packet. Add a couple of tablespoons of olive oil into the water to prevent the sheets from sticking together, and stir them occasionally with a wooden spoon. Transfer each cooked lasagna sheet carefully into a large bowl or pot filled with cool water to help stop the cooking process. Leave them in there until ready to use. This helps prevent them from sticking together or drying out. Previous Post: « Meal Plan for week #7! Love the fact you publish the nutritional value of your meal!!!! I pay attention to this a lot and it’s hard to track when it’s not given!! BIG PLUS TO YOUR SITE ! Was trying to find a new lasagna recipe and the white sauce caught my attention. OMG SOOOO GOOD! We loved it! It got devoured ! Glad to have find your site, first recipe but not the last one! This was my very first time making lasagna,so of course I looked on line for some guidance. Your recipe stood out to me for I am not a huge fan of ricotata. cheese. I made my meat sauce the way I originaly make my spaggetti sauce and instead of parmesean cheese for the brashmel I used cream cheese and more mozerella. This was the perfect Recioe for a beginners adventure to making lasagna. My guest were more than just pleased and begging me for the recipe. I added a little homemade french bread that i made to serve on the side which complimented the lasagna perfectly. I can not thank you enough for helping me make my lasagna the hit and the talk of the evening. I just made this today. Everyone loved it. As I am a picky eater when it comes to this dish. I loved it myself and I will be saving it for future use. Thank you for sharing. ABSOLUTELY DELICIOUS!!!! The name does not lie. We had my brother n law over for his birthday and some other family over, as well. Everyone raved about it. The flavors are amazing. I agree on the pork…it really makes the sauce! I will use that sauce recipe for everything!!! I was thinking I might put it over spaghetti squash next time! It’s delicious. My bechamel turned out a little runny…but i thickened it up with more cheese and a longer boil. I think I can perfect it next time. Thanks for sharing this family gem! So yummy! I thought I had the best lasagna recipe handed down from my sister who lives in Australia. This was fabulous. I’ve never made it with bechamel before. I’ve always used cream cheese. I also used fresh lasagna sheets, a much quicker option. Scooping it out of the casserole was a little messy, but maybe I didn’t let it sit long enough. Delicious! I’m definitely making for my daughters birthday.. If I make the night before, how long should I reheat next day in the oven??? This was the best lasagne hands down! I did incorporate one layer of ricotta because I had it on hand. Thanks so much for the recipe and also for a great bechamel sauce recipe. My bechamel sauce always turned out lumpy but this recipe was spot on. This is by far THE BEST lasagna I have ever made! My husband said, make sure you right this one down. I have 2 younger kids loved it and 2 teenage boy hockey players who billet with us who devoured the rest of before they went to bed😋 Thanks for sharing this recipe! My family enjoyed this recipe! Followed instructions closely and came out perfect. Only thing I did differently is added more Parmesan to sauce. Instead of 1 cup I used 1 1/2 -2 cups. Thank you I’ll cook again!! Hello all! I was wonderingif I could use onion powder instead of an actual onion as I have some family members who don’t like the texture of onions. Also, can I make the day before and refrigerate then bake the day of? White Sauce was water. 4 Tbsp melted butter + 4 tbsp of flour + 4 cups of milk was watery. What’d I do wrong? Oh no! I am not sure what went wrong. I wish I was in your kitchen to help you! This is the standard way to cook any bechamel sauce. Hope that helps! Just made this and my Husband said its the best lasagna he has ever tasted!! Will be making it this way again. Me and my friends will have a lasagna party this weekend and we’ll be making 2 lasagnas: one vegetarian and one following your recipe! Do you think we could cook them in the oven both at once? I’m really excited to try this recipe it looks beautiful! Yes, you will just want to check on them and rotate them around as they are cooking so each pan gets the right amount of heat throughout the meal. This is my very first review and I must say I followed the recipe and this was easy and delicious. Everyone love it from ages 4 to 60. Will make again for sure! If I don’t eat beef what Can I use as a substitution that would make this yummy? Would sausage work for you?! You can use ground pork, sausage, Bison, anything you like. If you’re Vegan, try frying Tofu. Flavor it then add it to your sauce. You can also chop zucchini, or other veggies. Anything that will add bulk to your lasanga and taste good. Good luck. It took a while to make, but DELICIOUS! It was a hit at the dinner table. People went for seconds! I used whole grain lasagna instead of the regular. I love the white sauce touch. Glad I chose this recipe. Would using the white sauce AND ricotta be an overkill? HMMM! That does sound delicious! Let me know how it turns out! Enjoy! This was the second time I tried making a lasagna and, thanks to your amazing recipe, it came out so much better than the first time! I tend to be better at making sweet treats so it was really empowering when I tried this recipe and the dish not only looked like yours but also tasted amazing! I’m gluten intolerant and was able to successfully substitute the pasta and the flour for gluten free ingredients. The only difference was that I needed to add two more tablespoons of the gluten free flour to the bechamel sauce in order to get a thick consistency and it took a bit longer to thicken. I also left out the bouillon cubes and it still tasted great! I got great comments on the lasagna 🙂 Thank you so much for sharing and I will definitely be trying some of your other recipes soon!!! Looooved it! Nobody talked during dinner, only heard moans and noms, haha. It was that delicious! Only had 1 pd of beef on hand so, instead of making a trip to the store, I substituted half of the meat required in the recipe with some lentils simmered in the same concoction of tomato sauce. Amazing! Will make it again and again, thank you so much! And that béchamel, my goodness! Licked the pot clean! This was the nicest lasagne I have ever tasted, let alone made. So good! I am gluten free so I just substituted the gluten ingredients for non gluten and it still worked great. Will definitely now be a favourite go to recipe! Easy to make and amazingly tasty! Thank you for this wonderful recipe, I made 1/2 of a recipe and it was so easy to downsize. My husband absolutely loved it. It’s a keeper. My apt smells amaze balls right now and tried the sauce as directed hen added red wine goodfellas style so yeah did not have 4cups milk so I used half cup milk and then sour cream and cottage chesee wit grated parm added to the original roo. Came together just fine. Can’t wait till I can feed the family with this. Thanks again. Delicious lasagna, nice and cheesey and quite easy to make. Everyone loved it and so glad I tried it as it will now be my lasagna recipe of choice. This recipe was errrrthang! I will keep this recipe for when I meet my future husband lol. I made this over the weekend. When I told my husband I was trying a new lasagne recipe he moaned. He’s not always happy when I try new things. Well, at first bite he was moaning with happiness. We all absolutely loved your recipe. It was so rich and creamy. The sauce will be a keeper as well for future purposes. Thanks so much. Once again Mama knows best! That is great to hear! I am so glad that he loved it! Thanks so much for following along with me! I’ve found the best lasagna recipe ever! Thank you for sharing this with us! I’ve made 2 trays with this recipe and they were absolutely, deliciously out of this world! Hi Karena , love ur recipes I cooked a lot of them already, I’m Egyptian so Bashamel is like a basic thing for us , after u make the sauce let it cool down then add one egg and some black pepper , it takes the taste to another level ! Thanks keep the good work up! That is awesome! I am so glad that you have found recipes that you like! Thanks so much for following along with me! What brand of garlic and herbs tomato paste did you use in this recipe. I can’t seem to find that flavor in my area. I used a garlic and herb flavored paste. I just get it at our local grocery store. I hope you are able to find a similar flavor at your grocery store. Even a regular tomato paste is great too! Have you made this in advance and if so, how does it come out? Is the moisture retained in it or does it tend to be drier? What are the adjustments you make in the cooking time too? I haven’t made it in advance but you are welcome to bake it and then freeze it so it does have all the flavors at the beginning. Hope that helps answer your question. We love lasagna but the way I’ve been making it since I was 19 had become a bit boring, so I set out to find a more advanced recipe. My main requirement – NO RICOTTA CHEESE. My husband can’t stand the stuff! 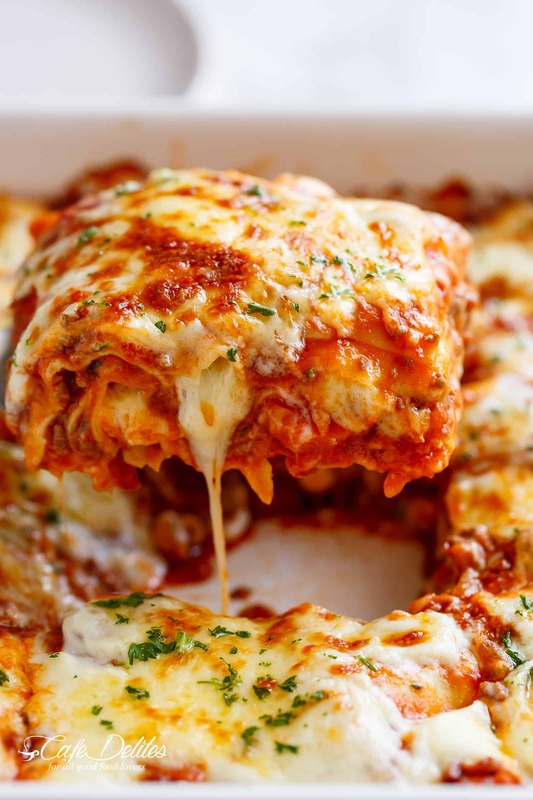 I literally searched “best lasagna no ricotta” and that’s how I discovered this page LOL. I wanted to make it for our Valentine’s Day dinner last night, so I made my grocery list per your recipe and headed out. I had never even heard of passata and was worried I wouldn’t be able to find any, but to my surprise Kroger had exactly one brand of it in the tiny Italian section next to the pasta. Evenings are crazy at my house, with kids getting home from school and homework, etc, so I started cooking early so I could assemble it and have it waiting to go in the oven exactly when I needed it. I made only one substitution, which was to use hot Italian sausage in place of the plain pork (we like our spice down here in Texas, LOL). This dish was perfection – despite the fact that my bechamel did not want to come together properly and had a weird texture (I just made some last week for chicken alfredo and it was perfect. Does that ever happen to anyone else – perfect one time and not even close the next? Ugh). Anywho, the taste was spot on so I just went with it, as I had already used all the parmesan for it. Well I am rambling now. My point is, this recipe is delicious, and easy to follow at that. My husband and kids have all declared it a keeper. My 6 and 8 year olds even gave it somewhere along the lines of “fifty hundred thousand thumbs up!” Thanks so much for sharing!!! AWE! Thanks so much for sharing! I am so glad that it is a keeper and that you all enjoyed it! Thank you for the rave compliments and following along with me! Hi, do you happen to use fresh crushed tomatoes or canned? And if we’re substituting the bouillon cubes for beef broth how much would that transfer into measurements? Thanks so much!! I like to use fresh crushed tomatoes but a can works just as good! One beef boullion cube or a teaspoon of boullion granules makes one cup of broth, so one cup of beef broth would be the equivalent. Would like to make for Ash Wednesday…can we make the sauce meatless and still have the great flavor? Of course! You may not have the same flavor but it will still be great;)!! Can you make this a couple days ahead. Yes, you are welcome to freeze it or refrigerate up to 3 days. Hope that helps answer you question. Made this tonight for my family. Everyone LOVED it. It was so delicious!! Only thing was , it was a bit messy. Maybe my parmesan sauce was too liquidy?? Thanks Karina!!!! Messy is good;)!! I am glad that it tasted great and that everyone LOVED it! That is the most important thing! Thanks for sharing! You are always welcome to use the can of beef broth instead if you would like. They tend to have less sodium in some of them. Hope that helps! Please post your recipe for Passata. I looked it up online and I am seeing several different ways to make it. Thank you. 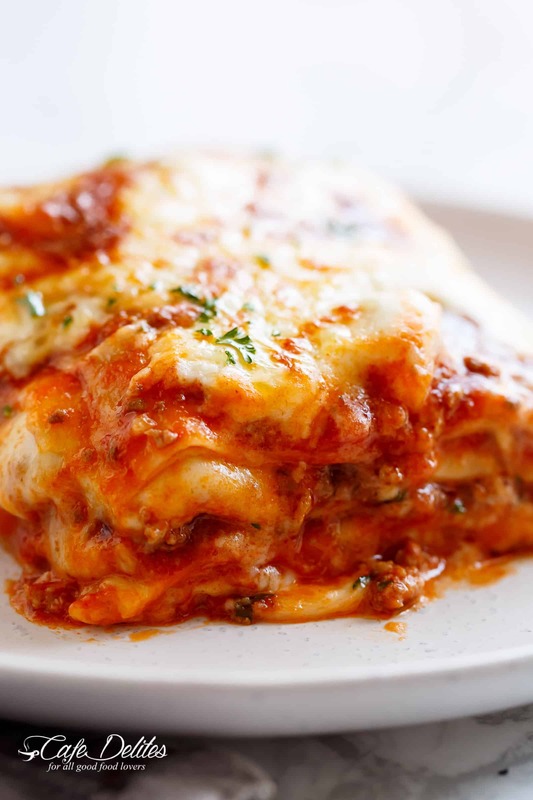 We like to layer the lasagna with a thin layer of meat sauce! You are welcome to try your way too! Pasta sheets are not available in my area. I’m afraid if I use cooked dry lasagna “strips”, the white sauce will leak into the meat sauce below. Anyone tried using those for this recipe? Hi Janet. Dry strips are fine to use. I’ve updated the recipe notes to include those for you ? This calls for fresh lasagna sheets which aren’t readily available around here. Would you suggest I substitute oven ready lasagna or regular lasagna and boil it first? Thanks. I’m looking forward to trying this recipe as I’ve never made one with a white sauce. HI Michael! I’ve updated the recipe notes to include those options. I would use Instant if you can find them to avoid pre boiling them, but it depends on what you can find. Either works really well in this! So..is there three layers of Lasagna sheets? or two? Let me know please, I want to make this for sure!..Looks Yuummmmy! Hi Michael, we normally get three layers! Do you have to pre cook the lasagna noodles? Hi Andrew. Not if you’re using fresh pasta. I’ve updated the recipe notes to include all options. is there no way to just get the recipe fo the lasagna? The recipe is at the bottom of the page. Hope that helps! I am definitely going to make this heavenly dish! 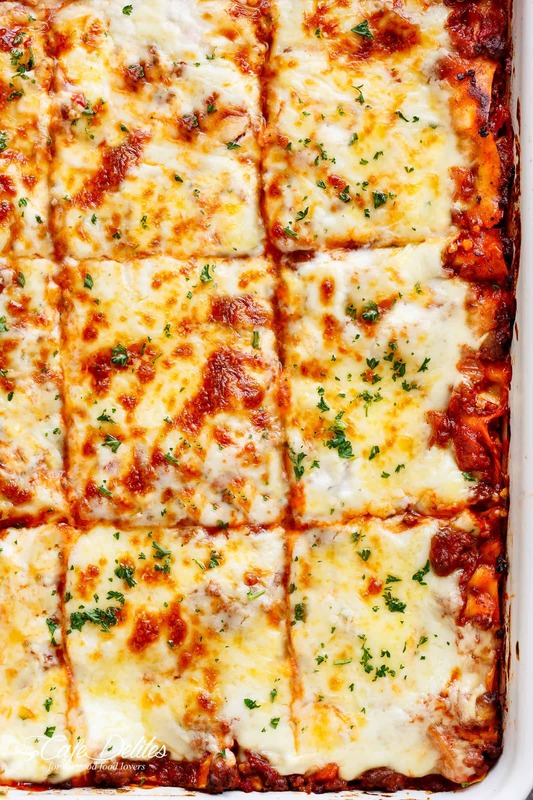 Question – are the lasagna sheets cooked before assembling? And if I can’t find lasagna sheets, when using regular lasagna pasta should I precook? Just want to make sure I don’t ruin your recipe.. Thanks Karina! The pre-cooked sheets need to be boiled before layering. Follow the instructions on the box that you purchase then add it to the lasagna. Hope that helps! Hello I have tried lots of your recipes and truly LOVE THEM ALL. So easy to make. Thank you. For this one I have a question. 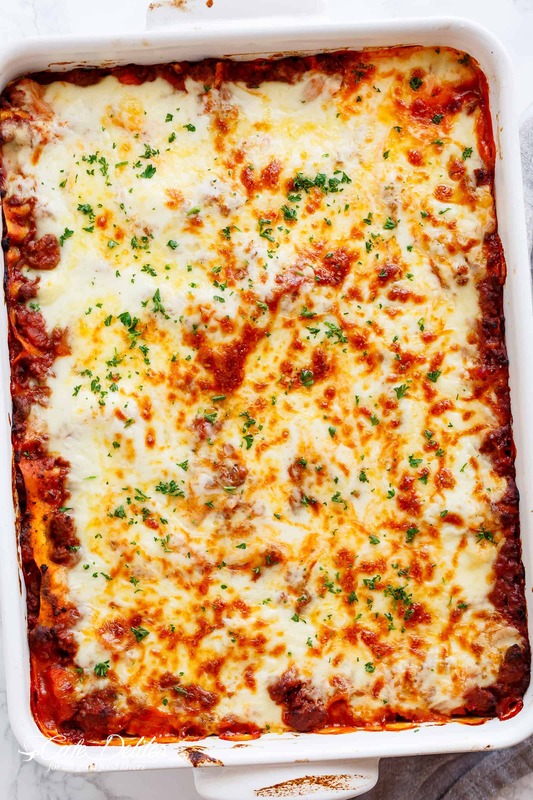 Do you boil the lasagna sheets before layering? It says fresh sheets so im confused. Probably a dumb question. AWE! Thank you so much! I really appreciate that! I would follow the instructions on the box of the lasagna sheets but normally no. If you purchase the pre-cooked ones then yes, you will need to boil them before. Hope that helps! I think I’ve finally found my perfect lasagna recipe. Can’t wait to try it but first I need to lose 20 lbs. LOL. This looks awesome and thank you (and your Mom) for sharing.